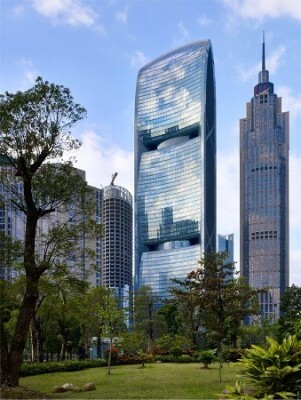 The Pearl River Tower, an environmentally-smart building that stands as a landmark within the Guangzhou skyline, has passed LEED-CS platinum certification - the highest LEED rating, thus becoming a big draw to multinational enterprises. Having attained the rigorous level of LEED certification, the Pearl River Tower is considered as China's first true green skyscraper and labeled the greenest building in China. A series of sustainable design and engineering elements, including radiant ceiling cooling system, solar panels, double-glazing curtain wall, demand-based ventilation air, and daylight responsive controls all contribute to the building's energy efficiency. While many of these sustainable attributes have been incorporated individually into skyscrapers around the world, the Pearl River Tower design represents the first time that they are used collectively, and thus it has been described as "one of the world's most energy-efficient commercial office towers" by Wall Street Journal and "world's greenest tower" by BBC.